Student at ISM ComputerIn this section of the AVBarn, you can learn how to do oral histories, transcribe them and index them. You can also find tips on using audio and video to record oral histories. Examples of good practices are in the form of instructional videos made by students in the Museum Tech Academy. They show you how to use equipment, formulate questions and research your subject, and interact with interviewees. 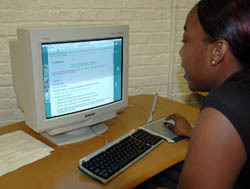 There are activities (pdfs) to practice researching a subject and formulating questions. Hands-on and digital activities are located in the Activities area of the AVBarn. Families can listen to oral histories together and create a painting, inventory their yards for insect species, write poetry, act out a drama, and investigate many other farming topics. Teachers and homeschoolers can use the activities lesson plans in four areas of study: Fine Arts, Language Arts, Natural Science, and Social Science. These lessons incorporate oral histories into the activities and are standards based (standards, including those in technology, are listed). A print and online resources page offers more information about doing oral history, historical research, and main topics explored by the interviewees, such as farming during the Depression, during wartime, and changes in farming during the 20th century.